• Music to your ears – The Brothers MacRae will fill the air with their brand of bluegrass and Irish tunes. • Eat, Drink and be Merry – Custom made burritos by Lonesome Cypress Catering to go along with a pint of Hopshire brews. 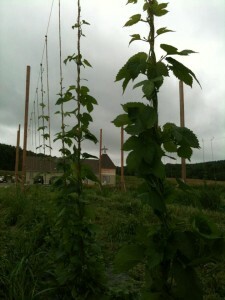 • Tour both our hop yard to see our rhizomes popping up and the brewery to see our 7bbl system and aging cellar. The festivities run from 2:00 to 6:00 on Saturday May10th, feel free to invite your friends and family for this special event at Hopshire! One Response to "Hopshire First Birthday Celebration!" Where can I find your beer…Beehave, outside of your brewery? It’s one of my favorites.